Looking at the hard drive they released yesterday, it's easy to understand why. As with my other articles; those of you with the requisite background knowledge can skip this next part. Fortunately, there's only three terms that really need to be explained here- OEM, Solid State Drive and NAND. OEM stands for Original Equipment Manufacturer. Basically, an OEM is a company that manufactures components or products for anything from computers to automotives. A few relevant examples are IBM and Intel. A Solid State Drive is pretty much what it sounds like. Whereas most computer hard drives consist of at least a few moving parts, solid state drives contain none. They're pretty much completely still. This gives them a number of advantages over standard storage devices, the topmost being that standard hard drives are easily damaged by too much movement or force; particularly while active. Solid state drives are far more durable and as a result far more portable. NAND is simply a type of solid state memory. If you want to learn more about it, as well as the differences between NAND and NOR, look here. With that out of the way, let's take a look at Foremay's new brainchild, shall we? Foremay's new NAND "disc on chip" measures at at 22x22x1.8 millimeters(0.87/0.87/.007 inches)(LinuxDevices). 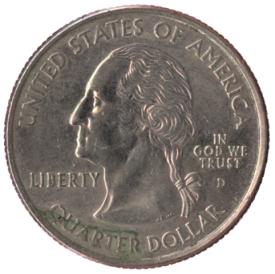 That's smaller than an American quarter. You could fit at least twenty or thirty of these things in your wallet, and still have some room left over. 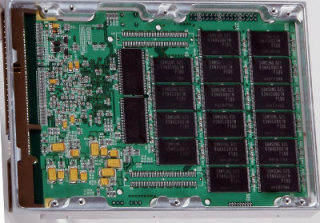 Foremay's intent is for these new hard drives to be soldered directly to a computer's motherboard (most hard drives are attached via external components). Not only will that save a ton of space, but I foresee it also reducing heat output and increasing the system's durability tenfold. Unfortunately, the size requires a few sacrifices be made. The new hard drive, part of Foremay's OC177 line of products, is, well...not exactly a titan as far as its specifications are concerned. It stores a modest 32 gigabytes worth of data, and possesses a read/write speed of 70/40 megabytes per second. By contrast, Intel's X-25 solid state drive has up to 120 gigabytes with a read speed of 250 mbps and a write speed of 70-110 mbps(Intel). Consequently, it's also more than twice the size of Foremay's DOC. Then again, computers aren't the only place something like this could be put to use. Cell phones, mp3 players,gps units...pretty much any portable electronic device which requires storage space could include one of these drives. At this point, some of you are probably thinking "there's SD cards that can store just as much space as this, and they're smaller!" The thing is, those are just storage units, not fully functional hard drives. They don't have the same capabilities, and they're generally less powerful than Foremay's SSD. Foremay's announced that they plan to ship a 64 gigabyte DOC by the third quarter of 2011(PRlog). Unfortunately, it's unlikely that either the 32 gigabyte or 64 gigabyte variety will be available to general consumers. The folks at Foremay have made their intent for this new innovation fairly clear: they're only shipping it to other manufacturers(ITproportal). They've not said much about the price, either, but I'm guessing innovation like this doesn't come cheap. The fact that something this size can store gigabytes worth of information is mind-blowing, if you really stop to think about it. Years ago- within most of our lifetimes-it was considered 'top of the line' to have a standard-size hard drive that stored a few hundred megabytes, and now...we're looking at tech like this and saying "Well, I suppose it's alright, but how does it stack up in power?" And someday- perhaps even in the near future- technology like this will be considered primitive! Rather fascinating, isn't it? But I've rambled on enough. See you folks tomorrow.